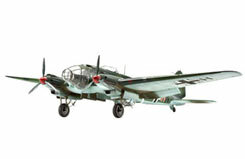 All Products > "04696 Revell 1/32 Heinkel 111 P Kit"
At the start of the Second World War the Heinkel 111 was the most powerful medium range bomber in the world. With a maximum speed of 410 km/h (255 mph) it was faster than most fighters of the period. After the Ju 88 of which a total 6200 were built, the He 111P was the Luftwaffe's most prolific bomber during the Second World War. Even though it was inferior when compared to all of the allied bombers, it was still in production until the Autumn of 1944. The concept of the He 111 was based on a fast passenger aircraft for the Lufthansa. It could carry ten passengers and completed its maiden flight in February 1935. The urgent requirement for a medium bomber finally led to the He 111 being modified and introduced as the standard Luftwaffe bomber. The He 111 had its first taste of action during the Spanish Civil War. Out of the initial stepped nose with limited forward visibility now evolved a bomber with a fully glazed asymmetric glass nose section that was later to become the trademark of the He 111. This version received the designation He 111P and went into mass production in 1938 as the P-1. Experience with this model led to the more powerful P-2 which in the summer of 1939 gradually replaced the P-1 within the Luftwaffe. A particular characteristic of the P-Series was the housing for eight ESAC vertical bomb magazines in the bomb-bay. For propulsion, the P-2 received two Daimler-Benz DB 601A engines each developing 110 Bhp. The He 111 bore the brunt of the attacks during the Battle of Britain in 1940.